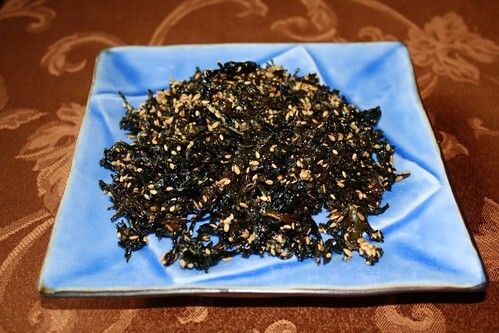 Miyuk (미역), also called Wakame in Japan, is a sea vegetable that is often used in east asian soups and salads. I’m sure you’ve seen “seaweed salad” at a Japanese restaurant before, those salads are made with miyuk/wakame. Miyuk’s health benefits are very well known. In Korea, it is a traditional ritual to make miyuk-kook (soup) for new mothers who went through labor so they can recover fast. It is so— amazingly good for you, and it’s crunchy and sweet! I add extra flaxseeds and sesame seeds for omega-3 and calcium, which is very important for a healthy vegan. You can just eat it as banchan or sprinkle it over your rice like a garnish! 1. On medium low heat (make sure you don’t burn the miyuk), put vegetable oil (more or less depending on how the miyuk soaks up the oil), and add miyuk and lightly stir-fry. 2. Turn down/off the heat when the miyuk starts turning slightly green/brown, and keep stirring till it’s evenly cooked (again, make sure you don’t burn the miyuk!). 3. When you see that it’s evenly cooked, remove from heat and add in the sesame oil, agave nectar, sugar, flaxseed and sesame seeds (Experiment with adding less or more ingredients to customize. For example, if you put in more seeds, it tastes nuttier – yummy. You might want more sesame oil or agave.). 4. Pour it onto a paper towel if you want to drain out the oil. Let it cool (tastes much better when cold so make sure to cool it, and you can keep it in the fridge up to a week) and then serve with rice. 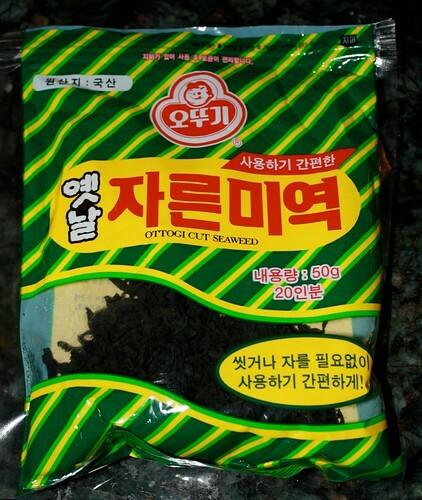 This is the kind of tiny-cut miyuk/wakame you will easily find in any Korean/Japanese grocery store! ← North Korea shells South Korean island, killing two. Sounds very good! I need to try it. I was wondering if you use roasted sesame oil (dark brown) or normal sesame oil (fairly light)? Makes a big difference in the flavour. I tried this recipe and it was good. I will reduce the sugar next time, just a tiny bit sweeter than I like. Thanks for the recipe! It’s yummy! I often see it in Trader Joe’s or Korean markets.